The online version of this article (doi: 10.1007/s00439-007-0460-x) contains supplementary material, which is available to authorized users. The eye color variation is a result of variable amounts and distribution of melanin pigment in the iris. In humans, the most remarkable eye color diversity is found among Caucasians. 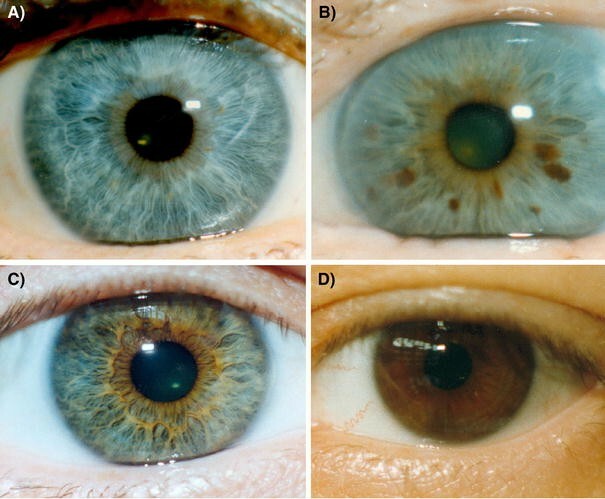 Blue/brown eye color genetics are known to the public as school example of monogenic inheritance, however, the variation in pigment concentration and the distribution of pigment in the iris (Fig. 1) suggest the eye color genetics to be far more complex as supported by recent data (Eiberg and Mohr 1996; Sturm et al. 2001; Zhu et al. 2004; Posthuma et al. 2006; Duffy et al. 2007). Loss of pigmentation in the skin, hair and eyes, also known as oculocutaneous albinism, derives from mutations in the genes OCA1-4 (Sturm et al. 2001). The locus responsible for the brown or blue eye color phenotypes (MIM 227220) was first identified by linkage to chromosome 15q (multipoint LOD score of Z = 32.2) in the Danish population by Eiberg and Mohr (1996). The candidate locus was mapped to 15q12-13 flanked by the markers D15S156 and D15S144 with a maximum LOD score close to D15S165 and OCA2 (MIM 611409) was suggested as the candidate gene. Subsequently, several other linkage and association studies confirmed the locus and OCA2 as the major contributors to human eye color variation (Sturm et al. 2001; Zhu et al. 2004; Posthuma et al. 2006; Frudakis et al. 2003) and 74% of the variation was estimated to a QTL, linked to OCA2 (Duffy et al. 2007). Attempts to identify the BEY/blue mutations in OCA2 have failed (Frudakis et al. 2007), and a variation within the 5′ proximal regulatory control region of OCA2 was suggested to be responsible for 90% of the eye color pigmentation variation (Duffy et al. 2007). The function of the OCA2 protein is ambiguous (Rebbeck et al. 2002), and it has been suggested to be a Na+/H+ antiporter (Ancans et al. 2001; Puri et al. 2000) or a glutamate transporter (Lamoreux et al. 1995). Both the functions indicate that OCA2 is involved in the supply of substrates to a tyrosinase in the biosynthesis of melanin (Ancans et al. 2001). Alternatively, OCA2 may be involved in the intracellular trafficking of the tyrosinase enzyme during melanosome maturation (Toyofuku et al. 2002). Upstream of OCA2 is the HERC2 gene (MIM 605837) located. Deletions of exon 86–90 or exon 53–86 in Herc2 of mice have been shown to affect eye and coat color pigmentation as well as sperm production leading to male sterility (Lehman et al. 1998; Russel et al. 1995). In humans, partial deletions of the OCA2-HERC2 locus are known in the Prader-Willi and Angelman syndromes. Both syndromes have been associated with oculocutaneous albinism or reduced pigmentation (Spritz et al. 1997) in several cases. The function of HERC2 is unknown but the gene encodes for deferent conserved functional protein domains involved in spermatogenesis, ubiqutin mediated proteolysis and intracellular transport (Yonggang et al. 2000). The human genome encodes for 3–12 HERC2 pseudo genes, most located on chromosome 15q, which have complicated studies of this region. Here we present evidence from linkage and association studies that a region in HERC2 contains a highly conserved regulatory element, which is the cause of blue eye color in humans. The influence of other loci like hair color, as controlling of the variation in the brown eye colors, are examined. A three-generation Danish family (CFB#694) representing 28 informative meioses was used for linkage analysis and the blue eye color locus was finemapped. The family used in the linkage analysis, association and haplotype studies were of Danish origin and retrieved from the Copenhagen Family Bank, the families used in this study (families CFB#604-1505) (Eiberg et al. 1989). Only families with siblings, who had blue and brown eyes, respectively, were included in the study. The parents and siblings were classified as blue-eyed (Fig. 1a) or brown-eyed (Fig. 1c or d) individuals. Haplotypes were constructed from 100 Danish informative selected trios families, and most of these parents were also included in the association studies. These 100 triosis represented 45 families where at least one individual had brown eyes and 55 families where all individuals had blue eyes. Families where green and brown eye color spots segregate were not used. The haplotypes were deduced manually from the family study. Additional control material for DNA sequencing was collected from two large Danish families from the Copenhagen Family Bank. Five individuals from Turkey with blue eyes, black hair and light skin and two individual from Jordan with blue eyes, black hair and dark skin were included in the association analysis. Additionally, two persons with natal heterochromia were examined. The blue eye color phenotype was defined as a complete lack of brown pigmentation (Fig. 1a), an intermediate phenotype was defined as “blue eye with blown dots” (Fig. 1b), an intermediate brown eye color phenotype was defined as hazel with a broad peripupillary ring and was named the BEY1 phenotype (Fig. 1c), and a complete brown pigmented eye color was defined as the BEY2 phenotype (Fig. 1d). All individuals in the study were interviewed by questionnaires and asked to determine their own eye color from the categories: brown, blue, gray and green, and whether brown spots or brown peripupillar rings were present. Hair colors were categorized as red, black, brown and blond hair at the time when the persons were between 20 and 30 years of age. In family CFB#694, the eye color for all individuals was documented by photos and all key persons were re-examined. All individuals with green eye color or blue or gray eye color with brown spots not located close to the pupil were excluded from the linkage and association studies. Genomic DNA was extracted from the whole blood using standard phenol/chloroform procedures and the study adhered to the tenets of the declaration of Helsinki. Database search revealed that the majority of the SNPs in HERC2 display low frequencies [q < 0.1, UCSC Human Genome Browser (July 2003) and GenBank dbSNP] and were not included in the association study due to lack of potent information. Many of the reported ∼2.000 SNPs in HERC2 can be explained by single base pair variations between HERC2 and the HERC2 pseudo genes. After exclusion of redundant SNPs, we were able to identify 15 polymorphic SNPs (supplementary Table 1) which were used for association analysis and construction of haplotypes (Tables 1, 2). Fishers exact test was used to test for significant genotype–phenotype distributions. The candidate region OCA2-HERC2-APBA2 for the BEY1 locus (Eiberg and Mohr 1996) was finemapped and haplotypes were constructed using the following STS markers and SNPs: D15S1002, D15S156, D15S1533, rs4074658, rs1129038, rs10680280, rs3054537, rs10627597 and D15S1048 (Fig. 2). SNPs were analyzed by direct DNA sequencing or restriction enzyme digests (PCR primer sequences are available in supplementary Table 1). Additional markers were tested and found non-informative in the analyzed families (data not shown). LOD score calculations were done using FASTLINK (Schäffer et al. 1994) and brown eye color was considered as a dominant trait to the blue eye color. The CFG#694 family members were previously genotyped with more than 400 markers (Eiberg and Mohr 1996). Four unrelated individuals representing the blue eye color phenotype (Fig. 1a), the BEY1 variant phenotype with several brown spots (Fig. 1b), the BEY1 (Fig. 1c) and the BEY2 phenotype, respectively, (Fig. 1c, d) were selected for identification of polymorphic nucleotide positions in the BEY candidate region by DNA sequence analysis. The three persons with the different brown eye color phenotypes were selected from families, where LOD scores higher than Z = 2.5 for the markers D15S1533 and rs10680280 in the BEY candidate region were achieved. The OCA2 promoter (Lee et al. 1995) and exon 1, 2, 7 and 10 and HERC2 exon 21, 26, 30, 33, 39, 44–47, 51, 52, 54, 55, 59, 72, 76–78, 85, 87–93 including the 3′UTR sequence were sequenced bidirectionally. The sequenced regions represented coding exons including non-synonymous SNPs, CpG islands, and regions coding for zink finger domains or phylogenetic conserved areas located in introns of OCA2 and HERC2 according to the UCSC-genome browser (primer positions and physical positions are given in supplementary Table 2). Oligonucleotides were designed using the software Primer3 in combination with ClustalW alignments for identification of unique primer sequences. Exon PCR amplification included minimum 100 bp of the intron–exon splice site. The primers used for sequence analyses of polymorphic positions in HERC2 are presented in supplementary Table 2. PCR was carried out using standard conditions according to the manufactures protocols, Taq DNA polymerases were purchased from Qiagen (Hilden, Germany), New England Biolabs (Ipswich, MA, USA.) and Applied Biosystem Industries (Foster City, CA, USA.). Reactions were carried out in 15 μl volumes containing the buffer, 2.5 μM dNTP, 10 μM of each primer, 0.008% cresol red (Sigma–Aldrich Co., St Louis, USA), 12% sucrose (w/v), and 50–100 ng templates DNA. Standard reaction conditions for all primer pairs were: 95°C, 5 min; 40 cycles 95°C for 30 s, 56.4°C for 30 s and 72°C for 1 min; followed by 5 min at 72°C. PCR reactions were analyzed by 2% agarose gel-electrophoresis stained with ethidiumbromide, 1× TBE, before sequencing. Sequencing was carried out according to the manufactures protocol using the PCR primers and BigDye ver 1.1 (Applied Biosystems, Foster City, CA, USA) without further modifications and analyzed using an ABI370 sequencer. Sequence data were analyzed using standard software (Chromas ver. 2.1, Technelysium Pty Ltd, Australia) and sequence alignments were carried out using ClustalW. Restriction enzyme digests of PCR products were separated by 2% agarose gel-electrophoresis, 1× TBE. 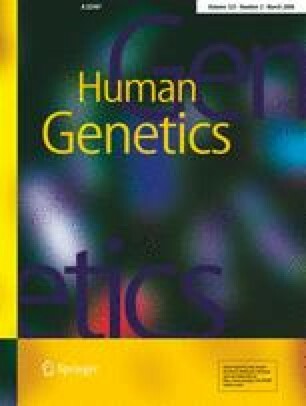 The human OCA2 promoter region position +80 to −435 was PCR amplified using genomic DNA from a brown-eyed homozygous individual using the HindIII and KpnI primer pair (supplementary Table 2). The PCR product was subcloned into pCR2.1-TOPO and confirmed by sequencing. The HindIII/KpnI OCA2 promoter fragment was further subcloned into the luciferase reporter plasmid pGL4.10 generating the plasmid pGL4 OCA2. The region in HERC2 intron 86 located at position −20,708 to −21,383 upstream from the OCA2 transcriptional start site was PCR amplified using the BamHI containing primer pair and genomic DNA from one blue-eyed person (the G-allele of rs12913832) and from one brown eyed (BEY2) person (the A-allele of rs12913832) (supplementary Table 2). The 675 bp PCR fragments were cloned into pCR2.1-TOPO and sequenced before subcloning into pGL4 OCA2 using the BamHI restriction site upstream of the OCA2 promoter. The two plasmids were named pGL4 OCA2-HERC2-blue and pGL4 OCA2-HERC2-brown. The transcriptional activity of the plasmid pGL4 OCA2, pGL4 OCA2-HERC2-blue and pGL4 OCA2-HERC2-brown were analyzed by transfection into Caco-2 and COS7 cells (Remenyi et al. 2004; Troelsen et al. 2003b), and the luciferase activities were corrected for transfection efficiency and normalized to the level of pGL4 OCA2. The brown (BEY2) and the hazel (BEY1) eye color phenotypes segregate in the Danish family CFB#694 (Fig. 2). Linkage analysis resulted in an LOD score of Z = 6.30 (θ = 0) for marker rs10680280 when segregation of the BEY2 phenotype was considered and an LOD score of Z = 8.10 (θ = 0) when the BEY2 and the BEY1 phenotypes were considered as one phenotype. Haplotypes were constructed for five microsatellites and four SNPs and revealed two key recombination events in individuals II-3 and III-4, respectively. This narrowed down the candidate region to be between rs4074658 and rs10602331 (Figs. 2, 3a). The SNP allele distribution in the candidate region was studied in 155 blue-eyed and 45 brown-eyed unrelated individuals (Table 1). A complete association was found for the alleles rs1129038*A and rs12913832*G (P-value 6.12 e-46) with blue eye phenotype and these two candidate SNP alleles were found to be in cis position (Table 1). Haplotypes using 13 SNPs in the OCA2-HERC2 locus were associated with brown and blue eye color in 200 parents from 100 trios. Ten different haplotypes were found where the haplotypes h-1 to h-4 represented the blue eye color and the haplotypes h-5 to h-10 represented the brown eye color phenotypes BEY1 and BEY2 (Table 2). One recombination event was observed between rs8028689 and rs2240203 in a family carrying haplotype h-4. This recombination could minimize the BEY candidate region to a 166 Kbp fragment between the SNPs rs4074658 (Fig. 3a) and rs2240203, which covers the region from OCA2 intron 1 to HERC2 intron 20 (Table 2; Fig. 3b). The rs4778241*A allele for haplotype 1 found in three persons could be a later mutation or a recombination event, since this marker is close to rs4074658. We have not examined this recombination further. The haplotype h-1 was found as the common haplotype among blue-eyed persons from Denmark and the haplotype was further found in seven unrelated individuals with the blue eye phenotype from Turkey or Jordan and in two persons with natal heterochromia. The following HERC2 exons 21, 26, 30, 33, 39, 44–47, 51, 52, 54, 55, 59, 72, 76–78, 85, 87–93 including 3′UTR and the OCA2 exon 1, 2, 7 and 10 and the OCA2 promoter were sequenced without detecting any causative DNA variations in the coding regions, the intron-splicing regions and the OCA2 promoter region. Sequence analysis of the corresponding regions in genomic DNA from the two persons with heterochromia showed that both the persons carried the blue h-1 haplotype. To elucidate possible regulatory effects of the two alleles of rs12923832, a functional study was initiated in cell cultures. The 676 bp fragment of HERC2 intron 86 containing the DNA variation was subcloned together with a 514 bp fragment of human OCA2 promoter elements into the vector pGL4.10. Gene expression array analyses indicated that Caco2 cells expresses OCA2 mRNA in their differentiated state (http://gastro.imbg.ku.dk/chipchip/, searchterm = OCA2), we therefore transfected the human colon carcinoma cell line Caco2 and also the African Green Monkey SV40-transformed kidney fibroblast cell line COS7 with the OCA2 promoter constructs (Fig. 4a). Both the cell lines were able to initiate reporter gene expression from the OCA2 promoter. The OCA2 promoter was approximately 10 times more active in Caco2 cells compared to COS7 cells. The 676 bp HERC2 fragment including rs12913832 reduced the expression of the luciferase reporter gene by 60–70% in both Caco-2 and COS7 cells. In Caco2 cells, a significant difference in repressor activity between the A- (brown) and the G-allele (blue) was observed (P < 0.05 Fig. 4a). These results suggest a conserved regulatory element in the intron 86 sequence that acts as a transcriptional silencer with gene regulatory power in colon carcinoma cell which could be the same in melanocytes. An electrophoretic mobility shift assay analysis of double stranded oligonucleotides carrying either the rs12913832*A or the *G-allele was performed using nuclear extract from differentiated Caco2 cells in order to investigate protein interactions to the rs12913832 region (Fig. 4b). Three specific protein/DNA complexes (Sc1, Sc2, Sc3 in Fig. 4b) were formed with the A-allele probe (lane 1), as these complexes can be competed by excess of unlabeled A-allele and G-allele oligonucleotides but not by an unspecific oligonucleotide (lane 2, 3, and 4). A similar result was obtained using the G-allele as probe (lane 5–6); however the binding pattern was different between the two variants indicating a differential binding of nuclear factors to the two variants. Especially the Sc3 complex is more pronounced using the G-allele probe compared to A-allele probe. Investigation of blond versus dark hair color in family CFG#694 demonstrated association of blond hair with the BEY1 phenotype and association of dark hair color with the BEY2 phenotype (P = 0.0056, Table 3). Analyzing the total material, the SNPs rs12593529*G and rs7495174*A were associated with the BEY2 phenotype (Table 3). A linkage study in this family using more than 400 markers versus dark or blond hair color resulted in an LOD score of Z = 4.21 at θ = 0.0 to the marker D14S72 which is close to a possibly candidate gene RABGGTA, for hair color (GenBank acc. no. NM_182836). Genes controlling the phenotypic variation of eye color from total brown versus blue eye color was previously mapped to chromosome 15q by a complete genome scan of five informative Danish families. The genome wide scan was expanded by a multipoint linkage analysis of additional 40 Danish families and resulted in an LOD score of Z = 32.2 (Eiberg and Mohr 1996) and excluded all other potential loci for the blue/brown eye color phenotype. The candidate locus was mapped to 15q12–13 flanked by the markers D15S156 and D15S144 with a Z max close to marker D15S165. This locus included the OCA2 gene, which was proposed as the candidate gene for the BEY2 phenotype. In this study, we have minimized the candidate region for brown/blue iris pigmentation by linkage analysis to a 1.1 Mb interval flanked by the markers rs4074658 and rs10602331 and further to a 166 Kbp fragment flanked by the SNPs rs4074658 and rs2240203 by haplotype construction within the investigated trios. This fragment includes the OCA2 intron 1 and the OCA2 promoter and the intergenic region plus the 3′end of HERC2 until intron 20 (Table 1; Fig. 3b). More than 97% of the analyzed persons with blue eyes carried the haplotype h-1 and the remaining 3% carried the haplotypes h-2, h-3 and h-4 (Table 2). The origin of these three haplotypes could be explained by recombination events or mutations younger in age than the original mutation. Seven unrelated individuals of Mediterranean origin with blue eyes carried the h-1 haplotype on both the chromosomes, suggesting this haplotype is identical for the blue eye individuals in other human populations. Our association study suggests both rs1129038*A and rs12913832*G as preferable candidate mutations responsible for the blue eye color phenotype. The strong conservation across species propose the DNA region where rs12913832*G is located to have important regulatory functions. This is supported by the ESPERR regulatory potential presented by the UCSC genome browser (Fig. 5a). We showed that a 676 bp sequence, representing the HERC2 intron 86 harboring rs12923832, reduced the expression of the luciferase reporter gene 60–70% both in Caco-2 cells and COS7 cells, when it was under control of the OCA2 promoter (Fig. 4a). These results support a regulatory function of OCA2 for this element and this regulatory function is conserved among species (Table 4). The rs1129038*A and rs12913832*G alleles demonstrated different regulatory effects on the OCA2 promoter activity in Caco2 cells, and this is supported by the EMSA study where different binding affinities of the Caco2 nuclear factors to the blue and brown alleles were shown. This infers that the two alleles have different gene-regulatory activities in vivo for the two alleles; however, given the large differences in observed OCA2 activity in two cell types used in the study, this would have to be addressed to experiments in human melanocytes. Searching for the possible regulatory element in the conserved sequence revealed the transcriptional binding sequence TAAATGTCAA (match 0.92, the rs12923832 A-allele is in bold) for the homeodomain transcription factor Cdx-1, and the corresponding G-allele results in a swift binding to the homeodomain transcription factor Nkx-2.5 (TAAGTGTCAA, match 0.98, the G-allele is in bold). Since Cdx-1 and Nkx-2.5 are expressed in the intestine and the heart, respectively, it is not likely that they are involved in the iris melanocytes development and regulation. This indicates that iris melanocytes express other homeodomain transcription factors involved in the regulatory activity of the conserved rs12923832 region. These differences in the binding affinity to nuclear factor by a G to A change in the recognition sequence can explain why the silencer-promoter complex involved in regulation of OCA2 gene can change conformation and thereby activity (Heinemeyer et al. 1998; Carter et al. 2002). The SNP rs12593529*G allele associated with the BEY2 phenotype (Table 3) is located in HERC2 intron 90 between the OCA2 promoter and rs12923832 (Fig. 5b). This SNP may have a stabilizing or destabilizing effect on the proposed OCA2 silencer-promoter complex. Interestingly, the rs7495174*A in OCA2 intron 1 was associated to rs12593529*G (Table 3) and suggest a common haplotype for approximately 30 % of individuals with BEY2 phenotype. The SNP rs12913832 is found to be associated with the brown and blue eye color, but this single DNA variation cannot explain all the brown eye color variation from dark brown over hazel to blue eyes with brown spots. All individuals carrying the BEY1 and BEY2 phenotypes in family CFG#694 (Fig. 2) shared the same two haplotypes h-5 and h-1. Further, all the brown-eyed individuals shared a 7.6 Mbp region that includes the entire OCA2 coding region from D15S113 to D15S144 (chr15: 23.8–31.4 Mbp) but excludes any regulatory sequences located in OCA2 exon 1 and upstream promoter region for the brown eye and brown hair color variations in this family. A recent study by Duffy et al. (2007) showed 90% association with the three SNPs alleles (TGT) in OCA2 intron 1 for human blue eye color. This region may have a regulatory function in the brown eye color variation, but is more likely that the TGT haplotype for these SNPs is associated with the h-1 haplotype identified for the HERC2 gene found in this study. However, our data for family CFB#694 were not in accordance with brown variations controlled by alleles in OCA2 intron 1, since persons having different brown eye phenotypes carry identical OCA2-HERC2 haplotypes. Studies of the BEY1 and BEY2 phenotypes showed association between blond hair and BEY1 and association between dark hair color and BEY2 (P = 0.0056, Table 3). RABGGTA on chromosome 14 is the closest candidate gene to D14S72 (an LOD score z = 4.21 for θ = 0.0) and this gene may moderate the brown eye phenotype in family CFG#694 as shown in Table 3. Mutation in RABGGTA gene is known to result in albinism in mice (Novak et al. 1995). Association or linkage between BEY2 and /HCL3 (brown hair color) has been described (Eiberg and Mohr 1996; Duffy et al. 2007), but the results point toward other loci unlinked to OCA2-HERC2 (Duffy et al. 2007). Candidates for these loci are the MATP and MC1R where association to human hair color has been found (Remenyi et al. 2004). Interestingly also the BEY2 phenotypes shows association with rs7495174*A (P = 0.0018) and rs12593529*G (P = 0.0010) in the OCA2-HERC2 loci (Table 3) which strongly suggests that DNA variation in this region is associated with the BEY2 phenotype (Eiberg and Mohr 1996). The mutations responsible for the blue eye color most likely originate from the neareast area or northwest part of the Black Sea region, where the great agriculture migration to the northern part of Europe took place in the Neolithic periods about 6–10,000 years ago (Cavalli-Sforza et al. 1994). In conclusion, we have identified a conserved regulatory element within intron 86 of the HERC2 gene that is perfectly associated with the brown/blue eye color in studied individuals from Denmark, Turkey and Jordan. This element had an inhibitory effect on the OCA2 promoter activity in cell cultures, and the blue and the brown alleles were shown to bind non-identical subsets of nuclear extracts. In total, all these data strongly support a model where the blue eye color in humans is caused by homozygosity of the rs12913832*G allele. Online Mendelian Inheritance in Man (OMIM), http://www.ncbi.nlm.nih.gov/Omin/ (for OCA2 and HERC2). UCSC Human Genome Browser (July 2003 and May 2006) http://genome.cse.ucsc.edu/cgi-bin/hgGateway?org=human (for detections of SNPs, conserved regions, exon-introns in OCA2, HERC2 gene and chromosome 15). We would like to thank Karin U. Hansen for technical assistance. The project was financially supported by the Danish Research Foundation (JN 22-02-0208). Wilhelm Johannsen Centre is established by the National Danish Research Center.